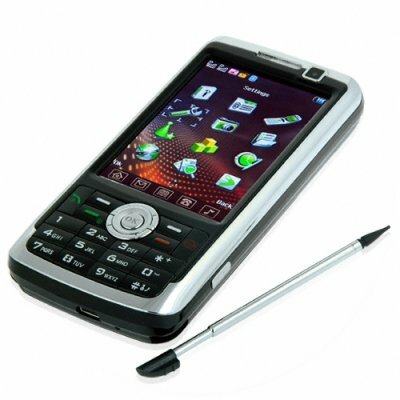 Successfully Added Quad Band Touchscreen Cell Phone - Dual SIM/Dual Standby Mobile to your Shopping Cart. Powerful quad band GSM with Dual-SIM + Dual-microSD cellphone with rich button keyboard and easy to use 3-inch touch screen display. Our classic model 237 with 2GB's of included memory and loud stereo speakers so you can enjoy your music and TV without earphones. Worldwide use four frequency band GSM/GPRS multi media cell phone with dual SIM, TV and FM radio, dual memory cards, and large keypad as its signature features. Have you previously been frustrated with the small screen size and limited memory available in todays PDA style media cellphones? Having a crisp 3.0 inch display and built in stereo speakers, this is one functional mobile phone that deserves to be recognized for its sharp design. And if you are a fan of text messaging, then the touch screen keyboard for SMS and MMS on this phone is going to make you jump for joy. With native quad-band GSM capability to keep you connected all around the world and dual SIM slots (with dual standby) allowing you to have two phone numbers in the same phone, its like you can have two full featured mobile phones packed into one! Did we say full featured? Let us tell you what you get with this mobile phone; analog TV receiver, FM radio receiver, MP3/MP4 player, digital camera and video recorder, image viewer, portable file storage (two micro SD cards included), Ebook reader, Bluetooth (including A2DP and FTP), and sound recorder. The CVSC-237 is proudly brought direct to you at a low wholesale price by Chinavasion Electronics! Powerful built-in stereo speakers; hear your ringtones for incoming calls even when you are two rooms away! Perfect, everything works as described. Also, shipping was very fast (5 days). The phone is perfect at all!!!!!!!!!!!! JUST AMAAAAZING.LARGE DISPLAY.FANTASTIC TV RECEPTION HERE IN GREECE.VERY GOOD RADIO.EASY MENU.AND WHAT A PRICE!!!!!!! !I WILL BUY MANY THINGS FROM CHINAVASION.FANTASTIC!!! !